Explore Fairy Pony Island with Holly and her pony friend Puck in this enchanting activity book. 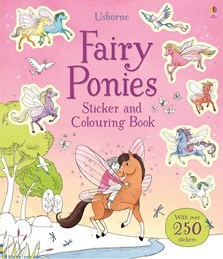 Among the magical scenes to colour, or create with stickers, are a unicorn garden, a visit to the grand Summer Palace of the Pony Queen, a dressing-up contest and an enchanted wood. Fairy Ponies fans may also enjoy the Fairy Ponies reading books.